A large shopping and leisure area on Yokohama Port. All train stations and facilities in this area are fully wheelchair accessible. There are shopping malls (Queen's Square, Landmark Plaza, World Porters Mall, etc), hotels, museums and Red Brick Warehouses. Those facilities have wheelchair accessible toilets. So wheelchair users can enjoy shopping and sightseeing. 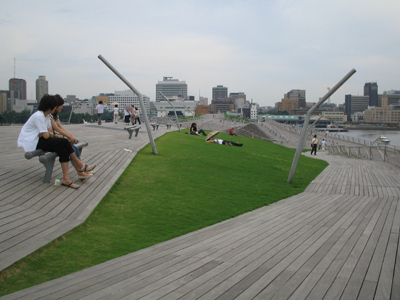 Most famous and historical park in Yokohama. A popular date spot for young couples. 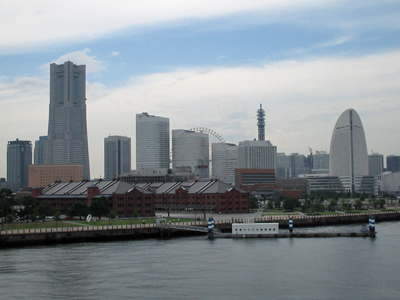 1 km far from Yokohama Marine Tower (wheelchair accessible) to Osanbashi Pier (wheelchair accessible). NYK Marine Museum is also wheelchair accessible. But wheelchair users find it hard to enter Ship Hikawa Maru because this ship has no lift. This ship is cultural heritage, so it cannot be remodeled to install a lift inside. The biggest China town in Japan. It is near Yamashita Park. Many Chinese restaurants and souvenir shops. Many restaurants have steps at their entrances. Some big restaurants have a lift and large toilets. Access: Minato Mirai line is fully wheelchair accessible, which is directly connected to Shibuya. JR Kannai Station has only escalators. JR Ishikawacho Sta has lifts. Metro Kannai Station is wheelchair accessible. A Leisure land surrounded by nature. There are an aquarium and amusement park. Both are wheelchair accessible. But wheelchair uses may not be able to take some thrill rides. Wheelchair spaces are available in the show seating areas. Access: Yokohama Seaside Line (Shin-Sugita sta., Hakkeijima sta. and Kanazawa-Hakkei sta.) is wheelchair accessible, Both JR Shin-Sugita Sta and Keikyu Kanazawa Hakeei Sta are also wheelchair accessible. Located near Shin-Yokohama Sta. Visitors take stairs in the museum, but there is a lift on back door. When wheelchair users take the lift, a staff member will accompany them down to Ramen shops in the basement. We can enjoy many kinds of Ramen (noodles) from all over Japan. Ramen restaurants do not have enough space for electric wheelchairs. We can feel the atmosphere of the Taisho and Showa period (the mid-20th century of Japan). Cupnoodle was created in Japan by Nisshin company. This wheelchair friendly educational museum is located near red brick wearhouse between Minato Mirai area and Osanbashi international port. We can make our original cupnoodle here. More than one million people go to the temple to pray for good fortune during new year‘s holidays (Jan. 1st - 3rd). Taking the Keihin Kyuko train at Keikyu Kawasaki Station is an easy way to access, and Keikyu Line is wheelchair accessible. “Tontoko” candy and arrowroot cakes are famous souvenirs. There is a ramp to the main hall. Most famous TV animation is "Doraemon" in Japan. Fujiko F Fujio is an author. His dreams are everything here. Of course it is wheelchair friendly. The ticket is pre-paid booking. We choose the entry time (4 times / day) when we book it. Location is Kawasaki mountain suburban area and far from railway station (non-step mini bus runs). Soccer World Cup 2002 final match was held in this stadium. Club World Cup games were held many times. The seating capacity is over 70,000. This is also a home stadium of a J-league team, "Yokohama Marinos." Many wheelchair spaces in the middle of the 1st deck. 1 km far from Shin-Yokohama Sta. Large Japanese garden located in south Yokohama. Quiet, nature, calm, one of the best Japanese garden in Tokyo metropolitan area. It seems not easy on rainy days by wheelchair because the road become mad. However garden trails are mostly flat. 1 hour south by car on highway from Yokohama central. Located Miura peninsula. Fishing ports and sushi are popular for tourists. The park is wheelchair friendly. You can enjoy sea winds and wild birds. Good 1 day trip from Tokyo to escape the city noise.